The motor vessel Miss Susan was transiting from Texas City to Bolivar at the time of the collision. Kirby Inland Marine, owner of the motor vessel Miss Susan and the barges, activated its emergency response plan immediately and is working in a unified response with the Coast Guard and the Texas General Land Office, which are on scene. A sheen of oil has been reported on the water, but the quantity of product released is unknown at this time. The six crew members of the motor vessel Miss Susan are all accounted for and are in stable condition. Barge loaded with marine fuel oil sits partially submerged in the Houston Ship Channel. Four skimming vessels have been dispatched and remain on-scene to continue recovering spilled bunker fuel oil. Officials with the unified command, who are overseeing the spill containment and recovery efforts, anticipate the ability to fully reactivate their efforts beginning this Sunday. An additional 20 response vessels are staged and are prepared to resume operations on Sunday. Approximately 90,000 feet of boom have been staged along the Texas City dike for deployment in containment efforts. The primary concern remains the safety of responders and the protection of the environment. 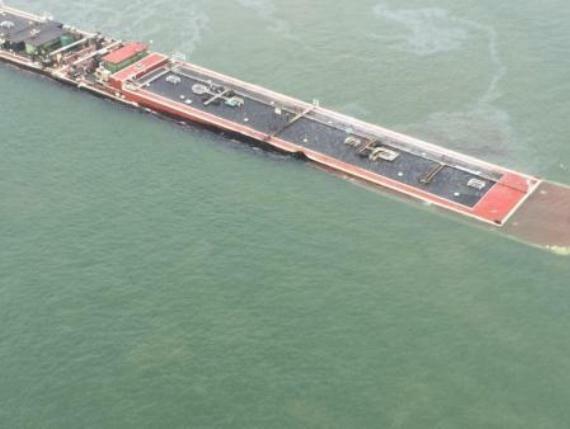 To ensure the safety of response workers in the area, and to prevent the spread of oil into other areas of the channel and Galveston Bay, a safety zone has been established, which restricts vessel traffic in impacted waters. The Bolivar ferry remains closed with the exception of EMS transit. Air monitoring continues to ensure the safety of workers and others in the area. 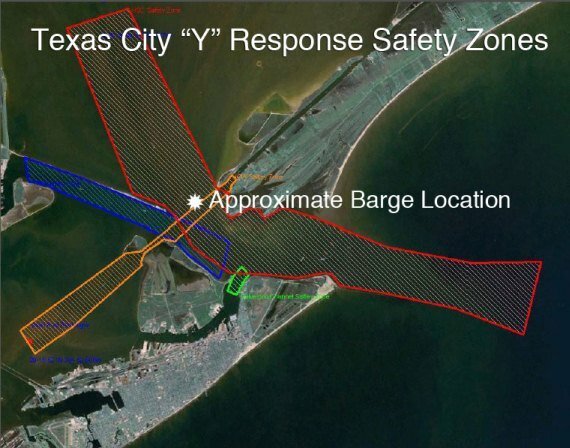 Safety Zone in the Houston Ship Channel. Efforts to contain and recover oil spilled after a collision that occurred Saturday in the Houston Ship Channel continue with an aggressive deployment of all available response resources, Sunday. Lightering operations to transfer remaining oil from the damaged barge are expected to be complete today. After the barges are decontaminated the damaged barge will be taken to a local shipyard for assessment and needed repairs. The Port of Houston remains closed. The Unified Command continues to assess the situation with oil in the channel to determine when vessel traffic can resume. There are 46 outbound vessels and 47 inbound vessels in the queue for transit in the Port of Houston. The Port of Texas City has 5 inbound and 3 outbound vessels in the queue awaiting transit. Once the channel has been determined safe to navigate, and transiting vessels will not spread oil contaminants, a prioritization list will be established to determine the entry order of vessels. More than 71,000 feet of containment boom have now been deployed on waters surrounding the incident site and along sensitive shorelines in the area. An additional 192,500 feet of boom has been staged for possible deployment and another 20,680 feet ordered. Changing currents, winds and weather conditions have necessitated response officials to further extend oil recovery plans into the Gulf of Mexico and south along Galveston Island. Approximately 27 response vessels are actively working to skim and recover oil with more than 539 personnel actively on-scene and another 218 responding in the incident command post.